Ideal for turf and snow removal applications, the BA model angle brooms feature a hydraulic-angling range of 30 degrees to the right or left of the machine. 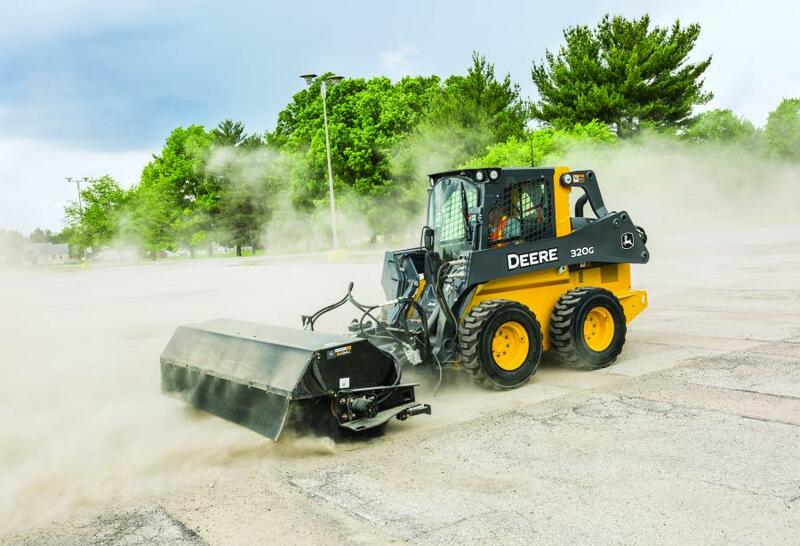 "With new OSHA silica dust exposure rules, contractors are in need of attachments with options that meet these requirements and make contractors more competitive bidders," said Jessica Hill, program manager, global attachments, John Deere Construction & Forestry. 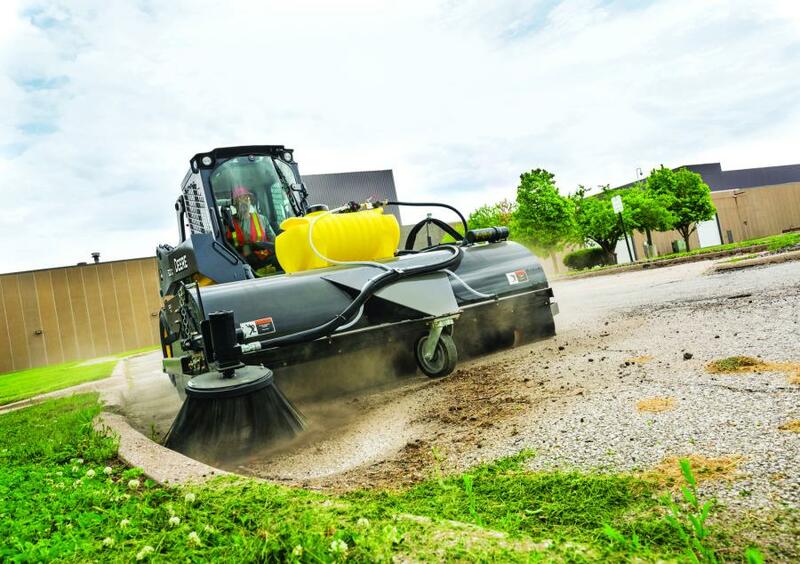 "We designed a new class of brooms to deliver more durability and job site protection to help our customers get the most of out of their investments." The new pickup brooms are solutions for dust mitigation challenges and restrictive barriers, like curbs and sidewalks. These pickup brooms feature a 26-in. (66 cm) diameter brush with standard 50/50 poly-wire segments and optional all-polypropylene brush segments, allowing operators to customize the attachment to their job site. The BR models use bolts for precise brush-contact adjustment, while the BP models incorporate a tool-free system for fast, easy adjustment. BP models feature a 0.5-in. (1.3 cm) single-bevel cutting edge; BR models have a 0.625-in. (1.6 cm) double-bevel cutting edge. Optional 25-gal. (95-L) broom-mounted or 30-gal. (113.5-L) roof-mounted water-tank kits are available for dust-suppression applications. An adjustable baffle on BP pickup broom models increases hopper capacity by 22 percent, offering greater sweeping impact in each pass. A front caster wheel on BP models allows the brush to follow ground contours, while a front bumper on BR models provides extra strength and protection when sweeping close to walls or obstacles. An optional 20-in. (50 cm) gutter brush with wire bristles can be mounted on the right or left side of any model pickup broom for collecting material close to curbs. Ideal for turf and snow removal applications, the BA model angle brooms feature a hydraulic-angling range of 30 degrees to the right or left of the machine. The 32-in. (81 cm) diameter brush features standard 50/50 poly-wire segments, a well-suited combination for dirt and debris cleanup on hard surfaces. Optional all-polypropylene brush segments are available for work on softer surfaces. Brush-core removal for bristle replacement is quick and easy, with no tools required. Foldaway storage stands help the brush maintain its round shape when not in use. An optional hood extension provides 180-degree brush coverage, while a rubber deflector prevents snow from blowing back onto the machine when winter strikes. An optional 30-gal. roof-mounted water tank kit is available for applications that require dust suppression. For added performance and durability, both the pickup broom and angle brooms feature a heavy-duty, high-torque, bidirectional motor coupled to the brush core through a 2.5-in. (6.3 cm) hex hub. The attachments' motor and bearing are protected within the broom-frame structure. Motor and bearing separate from the brush core without having to disconnect any hydraulic hoses, eliminating the risk of oil spills or contamination.